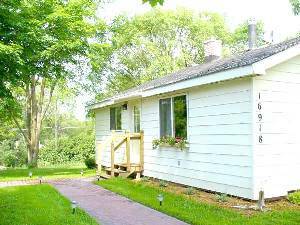 This newly renovated one-bedroom, one-bath, pet friendly cabin is centrally located with easy access to Traverse City, Manistee and Cadillac. It’s the ideal base from which to explore all that Northern Michigan has to offer. The cabin is located near HWY M-115 on the outskirts of the village of Copemish - 5 minutes from Crystal Mountain Resort. It is situated on 10 acres of land, including a 7 acre dog run area. If you are seeking relaxing accommodations with easy access to some of the best Up North attractions, this is the place. Please check out our website at www....net for more information, including links to area attractions. We enjoyed a wonderful weekend at the cottage. The kids, parents and dogs all loved staying here! place to get away to. The pooches loved it, too. starting point for many Up North adventures. Georges Retreat was perfect! Our dogs thought this was a vacation for them, with the fantastic property to hike and roam, and beautiful view of Crystal Mountain at the top of the hill. The cabin was clean, roomy, comfortable, and well appointed, makeing us feel right at home. Just booked it again for a return visit! George's Retreat is just that...a RETREAT. It was so clean and comfortable and we both felt right at home there. We will definitely return. Lovely! The cottage was clean and cozy.Great outdoor activities for us and our dog.Hope to be back soon! Thank you! The most home-like stay we have ever had. The availability of the washer and dryer added a level of convenience and enhanced our stay. I can't imagine staying anywhere else when visiting the area. a casino. Thanks for a lovely time! May 31, 2011 Reviewer: Liz R.
Booked the place at George's to take a break from work stress and it did the trick. Clio the dog LOVED the place and we had a great time roaming the grounds (off leash). Very nice, clean, modern accommodations and a great location for exploring an exceptionally beautiful part of the state. Lovely house and superb location. Quiet and private. Also comfortable, warm and clean. 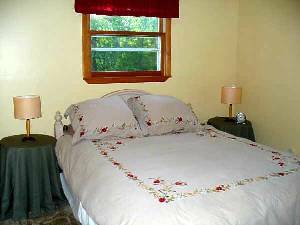 We appreciated having linens provided, along with many other conveniences (kitchen, gas stove, DVD player, laundry, etc.). A grocery store and gas station are nearby, should you need supplies. The sauna was wonderful and relaxing. 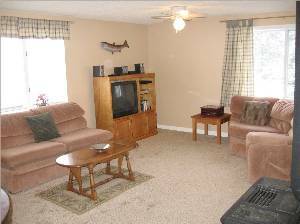 The house is in a perfect location for exploring Sleeping Bear Dunes National Lake Shore, the Manistee River, Manistee National Forest, and many fantastic places along the coast of Lake Michigan. 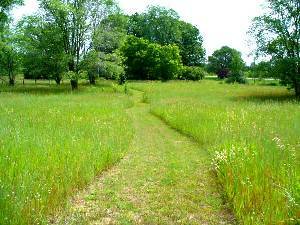 Easy access to the North Country Trail for hiking. While out exploring we saw two bald eagles, four wild turkeys, and of course lots of deer. We enjoyed the beautiful sunsets! We would recommend George's Retreat to friends and family. We were referred to George's Retreat by a friend and couldn't be happier. We visited the area at the end of September and found the quaint cottage and small time quite relaxing. We absolutely LOVED that we could bring our dog with us too. The trails were perfect for walking in the morning and mid-afternoon. Not too far from main attractions. We took a day and drove to Traverse City and in and around the bay area, and spent the next day up near Sleeping Bear Dunes. The amenities made us feel right at home and loved that there was an onsite washer/dryer, stove, microwave, refrigerator, and grill. We plan to spend a few more days up at George's Retreat next year! We were looking very last minute for a place to get away for a week for our anniversary. When I saw the availability for George's retreat, I knew it was karma. What a WONDERFUL place. The fact my dogs (my kids) were welcome was the best part of all! We fell in love with the area and have recommended the place to family and friends. Thanks for a great stay. My husband and I had such a wonderful stay at George's retreat. I truly noticed and appreciated the attention to detail in the cabin from the lovely pancake mix basket on the stove to the closet full of extra pillows and blankets! Our dog loved the yard and we found ourselves hiking on the property for at least an hour a night. The cabin was so clean and inviting, we cannot wait to visit it again! We just got back from a weekend at George's Retreat. The cheery atmosphere and full cupboards of supplies as well as the barbeque and firepit outside made us feel very welcome. We loved being outside of the tourist hustle and bustle with our dogs and they were very happy. A great inexpensive golf course was not very far away and the scenery was beautiful! Our stay at George's Retreat was a memorable one. Our two dogs loved it just as much as we did. It was very clean and we loved the trails. Our youngest dog was in seventh heaven. It was close to Traverse City and we enjoyed taking a trip up to wine country, just beautiful - worth the trip. We will be staying again at George's - it is like home away from home. My wife and I stayed with our dog for the weekend. We had an absolutely wonderful time. Very nice accomodations. We had a blast going to the beach in Frankfort to swim in Lake Michigan with our dog. We had a wonderful campfire, and really enjoyed just sitting out on the deck and relaxing. It rained a little saturday morning, so we took advantage of the satellite tv and relaxed on the couch. We will for sure be returning and will mention this spot to many of our friend. Great time! My boyfriend and I visited George's Retreat in July for the second time in the last 2 years. We were so pleased with the cabin, the location, and everything about George's Retreat the last time we thought we'd go again. It's the perfect getaway for a couple or a family looking for relaxation and good old-fashioned fun. I would recommend it to anyone! My husband and I, along with our Puppy Seymour,spent 4 1/2 days at the cabin mid-May and loved it!! The cabin and grounds were very clean and had everything you would need. It was very relaxing and quiet! Would definately visit again and recommend it to anyone looking for a quiet getaway in a very pretty part of Michigan. We stayed at this little gem January 29 & 30th and couldnt have been more pleased with the accomodations. The cabin was clean and spacious, with all the amenities for a perfect weekend getaway. Close to Crystal Mountain and the grocery store in Copemish, location was perfect. The Sauna was a welcome place after a day of snowboarding and we enjoyed a short snowy hike on the property the day we left. Best pet friendly place I've stayed in a long time. My husband and I stayed at the cottage for 6 days with our two dogs. It was clean and nicely decorated. The hiking was amazing. We went hiking or snowshoeing every day. The scenery was breathtaking. We also traveled north to the Leelenau Peninsula and went on a wine tasting tour one day, ending with dinner in Traverse City. We had a wonderful time, and so did our dogs! We had a great time at George's Retreat! The dogs loved playing outside, and we loved our little escape. The cottage is very cozy - I even cooked Thanksgiving dinner. We will definitely be back in the summer. Thanks again for a great getaway that could include our dogs. This place is an absolutely wonderful little getaway. We never saw another person unless we went to town. We hiked the trails and our 2 little dogs had even more fun than we did. Kitchen is very well equipped and the grill was fabulous. Not much in the town, so plan on cooking or driving at least 15 minutes for a decent restaurant. Or better yet, just stay and enjoy this secluded little getaway! This is our second trip to George's Retreat and and we've had a lovely stay both times. We love the house and the attached land is immense. There are beautiful and scenic views from the top of the hill and our dog loves to take us on walks on the wonderful trails. We have recommended this hidden gem to our friends and family and we hope to be back next year with our new baby and of course our dog. My husband and I with our two dogs had a wonderful time at George's Retreat! It was very clean and comfortable and they had everything we needed to cook with. I loved waking up to dear in the front yard two out of the three mornings we were there! The dogs loved to run in the trails by the cabin every day and we were close to Manestee Forest for a long day hike on the North Country Trail. We will definitely be back! We definitely enjoyed our stay at George's Retreat, cozy, relaxing, comfortable and a pleasant and quiet setting. The trail was great for walking Oscar, our dog, also walked a small part of the Betsie Trail that we picked up at nearby Thompsonville. When it wasn't good walking weather visiting the many wineries in the region was a great option! Now that we are home I miss the cottage!We loved the location.The fact that it was light and bright and Clean! The Sauna was great!!! !Really thought the location was just right for going to the SBNPark and Traverse City. Also liked that a great market was close by for us who forgot things. PS Hayley like walking up the hill and enjoyed the turkeys playing hide and seek from her. Super vacation! I am an early bird and got to watch a coyote play in the field across street from cottage one morning and then watched deer the next. Super clean and near the Lake, tubing and of course ice cream. We will be back. Wonderful quiet setting. About 30-40 minutes from most tourist interests, making it a nice central location. The home was very clean, comfortable and relaxing. Highly recommended if you want time away without alot of touristy hassles. August 19, 2009 Reviewer: Doug Burke/Karen Walsh From: Oak Park IL. go. We will definitely be back. We stayed here in mid-July with our 13 yr old daughter and two dogs - what a wonderful experience. The house was clean and the dogs enoyed hiking up the hill daily. The location was 45 minutes to everywhere we wanted to go - but worth the drive - we felt comfortable leaving our dogs there. We look forward to coming back soon. Wonderful place to stay...Three adults plus two children (ages 3 and 6) and two dogs (1 year old Lab-mixes) fit just fine in the Retreat. The property surrounding George's Retreat was great for morning & evening walks with the children and dogs; we couldn't have asked for a better set-up! Location was perfect for day trips to Sleeping Bear Dunes. We made two day trips there. The two regions where we went (dog friendly beaches) were ~30 and 45 mintues away from the cabin (leasurely drive pace). We will definately be back....maybe for skiing in the winter (Crystal lake/mountain ski area entrance was only a 4 mintue drive down the highway from George's Retreat). I truly enjoyed my stay at the cabin. It was cozy, clean, private, and provided many amenities. 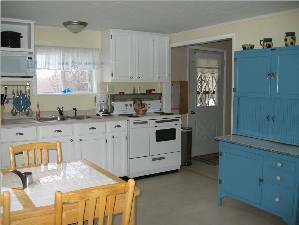 It's in a good central location, with an ice cream shoppe within walking distance! My dogs enjoyed the stay too. We came up to have a girls weekend away from the city and we sure got it! The place was warm, cozy, and very clean. The fire pit was awesome. When hiking out behind the cottage, we even had a deer cross our path! Not to mention that my dog was in heaven being able to roam around. Thanks again for a great stay! June 29, 2009 Reviewer: Graham Goodrich From: Grand Blanc, Mi. I recently spent the weekend at the cabin with my girlfriend, my cousin and his wife, and our two German Shepherds. I couldn't come home and NOT write a wonderful review. We had such a nice time. The location is truly perfect! Far enough from home yet all of the conveniences one needs. The fire pit is great, the cabin so clean, organized and neat. I have referred family already, and we will surely be back. Thank You for a wonderful time. My family had a very relaxing and peaceful stay at George's retreat. The accomodations were nice, the area quiet and we appreciated the isolated yard and land that the house is situated on. We took our dogs and walked out back to where the view is really amazing. We enjoyed sitting around the campfire and was thankful for all the kindling that was gathered for us in the pit. We really had a good time going to all the sights in the vicinity, and was glad the house is centrally located. We will be back again, that's for sure! Our second stay to George's Retreat was just as enjoyable as the first. Clean accommodations, wonderful sunsets and a quiet, relaxing atmosphere. What a great place! George's retreat has everything you need. It's a home away from home. And your dogs will love it too! My Mom and partner stayed last year for the mushroom fest in mesick. All we can say about the place is- WOW! It was like stepping into someones home when they were out. Everything was fantastic! Some friends came up from Kentucky and there was plenty of room for them too! We didn't find a huge quantity of mushroom, but we had enough for a great cookout on the deck. The sauna was a treat too. And we walked for hours back on the property. We sure hope to return soon. Thank you for a wonderful- clean place! We loved it! My husband and I stayed at George's Retreat with our dog last October and loved it. Clean, cozy, all the comforts of home and wonderful trails to explore with the dog. Priced very fairly. We look forward to renting this home again. We really enjoyed our stay at George's Retreat last month, as did our two dogs! The cottage is very sunny and bright - loved the decor - and the yard and surrounding property was great fun for the dogs. We'd definitely stay there again. My husband and I rented this charming place for our honeymoon this past weekend..it was absoultly perfect! We fell in love with the place and knowing that everything was provided made it perfect. They even left us a welcome basket! The place was very neat and clean and well maintained. It's in a quiet setting and was perfect for our honeymoon! We hope to go back there next year for our first anniversary! We had a very relaxing and wonderful time! When you search for a place online you never know what you will end up with. George's Retreat exceeded our expectations! Very comfortable, clean, fully equipped. Location is convenient to all areas we usually visit Up North. Owners were a pleasure to deal with. We will definitely stay there again. We had a great time at George's retreat. The cottage was very clean and had everything we needed. We appreciated all the little touches like the welcome breakfast gift, a lighter for the firepit, etc. Our lab enjoyed the large field where she could run around, and the trails had a beautiful view. There is a very nice pool at Crystal Mountain, and one evening we listened to music at the top of Crystal Mountain. We brought our bikes and rode the trails in Frankfort and Beaulah. Recommend canoeing at Hanmer's on the Betsie River. Much less crowded and nicer than Riverside. Hope to return in the winter for skiing. This cabin is not a cabin, nor a house! It was like walking into someones home! So many wonderful homey touches everywhere! The sauna was wonderful too! Very quiet area- we will surely return. We all slept like babies! All the townfolk were so very friendly too, just can't say enough good things! This will stay on my "favorites list" always! Thanks Shirley. Doug, Jack and Dorothy. We had the most amazing time ... our dogs loved it too! Not only were the accommodations terrific ... Don and Shirley were the best!!! When our snowmobiling trip could have ended up a wash because of mechanical problems, they were there to help in any way they could ... Thanks again! We will be back! Wow, did we luck out! What an excellent location, and cherished space. The house, sauna, cozy kitchen, and comfortable bed made this one of my favorite trips of Michigan ever! We explored several cross country trails and towns such as glen arbor, and empire. The bartender at Copemish Lounge was also a delight. Thank you. This was truly such a wonderful place, very cute, cozy, well kept and very welcoming - pride of ownership definitely shows. The pancake batter, Michigan maple syrup and other welcoming touches along with comforts such as the varied DVD selection, stereo and satellite tv made my 10 yr old niece feel right at home - and give it a thumbs up. We lucked out & got to enjoy an unseasonable warm October weekend spent relaxing, sightseeing and taking in the beautiful multicolored Michigan fall landscape while exploring the many trails just steps away. Thank you!, this is just the thing 2 city girls needed and I hope to come back again soon - and stay longer next time. My dogs absolutely l-o-v-e-d it here! location from the other major cities, and was well kept. It is a great cabin if you have dogs-they loved it too! We enjoyed our stay at George's, the cabin was great and the kitchen was especially well-equipped. We did have problems with the rollaway beds, neither worked properly. Luckily, our kids could just use the mattresses on the floor. We hope to return perhaps in the fall or winter to take advantage of other seasonal recreation. We had a wonderful time at George's Retreat! The cottage was clean, well supplied, and charming. Very much more than what one would expect! It's a place where you can pack your clothes (and golf clubs! ), buy your groceries, and sit back and enjoy! Hope to have the opportunity to visit again. George's Retreat was a very nice, clean, well kept cottage with wonderful land. Our 2 golden retrievers had the time of their lives. We were only sorry it wasn't cool enough for us to use the sauna -- looks just like the cottage -- clean and well kept. Would definitely rent it again. Having experienced many different cabins in our Family Vacations. We have found George's Retreat to be one of the best and top of the line. From the Welcoming Treats, to the very nice Furnishings, to Excellent beds and well supplied cabin in terms of cooking utensils, and excellent washier and Dryer. This place has all the feels of being at home away from home. The view from the trails are out of this world. The Kids had a great time. Another great draw to George's Retreat are the people of Copemish! Who in small and different ways were very friendly and helpful, from the local Supermarket to the local Hardware, to the local Auto Mechanic, to the local Church! Things that now days we don't see down state. If you are looking for a great place to relax and rest or a change of pace or to experience friendly people this is the place! We had a most wonderful time at George's retreat. It was our honeymoon, and it was a perfect place for a honeymoon. The house was absolutely fabulous, very warm and homey. We walked up the trail to the summit for the sunset overlooking the trees, wow. I would recommend George's to anyone wanting a very special place to stay, and relax. Thanks for the honeymoon surprise, you left for us. We will definitely be back. The Happy Honeymooners!! We had a fabulous stay at George's Retreat. It was more than comfortable, and so absolutely perfect for our dogs. Thank you - we'll definitely be back. We had a great time at George's Retreat even though the mushrooms were scarce. 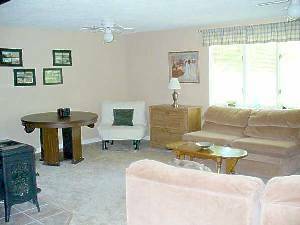 The place is immaculate and has quality furnishings. We hope to return again in the spring. We would recommend this little gem to anyone. The sauna was great and we loved the fact that we could bring our dog. We had a great time. Couldn't have been more comfortable and more laid-back. Enjoyed the snow while people were riding their bikes around in shorts back in Chicago. One last great winter weekend. We'll definitely come back up before too long, especially if the dogs have any say in the matter...which they always do. Thanks again. great place for kids and dogs! This place is wonderful. The house is very well kept and well decorated. We immediately felt at home and comfortable. We loved that we were able to bring our dog with us (a definite plus). We will definitely be coming back again! everywhere. We will definitely come again! We had a great stay at George's Retreat! It was immmaculately clean and decorated very nicely. We enjoyed the sauna out back and walking up the big hill to see Crystal Mountain in the distance. We would definitely stay there again!!! We loved George's Retreat! We had hoped to snowmobile, but unfortunately the weather did not cooperate. We can't wait to return to use the snowmobile trails and to ski at Crystal Mt. We had a lot of fun with the bumper pool table! What a great treat with such excellent accomodations for our whole family including our dog! Comment Text: Just wanted to let you know how much we enjoyed our stay at Georges Retreat. forward to renting the cabin again in the future. Cabin was comfortable and clean. Extra thoughtful welcoming treats were waiting for us upon our arrival. Walking trail afforded great views from hilltop. Relaxing location. Look forward to returning in future. We could not have asked for better accommodations for us and our Lab. It was clean, comfortable and relaxing. We met really nice people in the small town and found its location to be great for outings to the lake and the Traverse City area. We experienced George's Retreat in November, and hope we can return to the same spot in other seasons. In a way I hate giving this place the rating it deserves. If too many people find out about it I'll never be able to book it again and I'm planning on it. But I have to give it four stars. It was clean and well maintained with lots of small touches making it a treat to visit. I won't list them but I'm sure the next new renter will be as pleased and surprised as I was. I can't say enough about this perfect place for a peaceful, relaxing getaway. It is exactly what my best friend and I were looking for. The cabin was even better than your pictures and the property was just breathtaking. In addition, the closeness of so many of Northern Michigan's beautiful places and things to do. We are definitely planning on a return visit. Best place we have ever found. This place was beautiful. It was my first trip to Michigan and I will definitely be visiting again. The cottage was very comfortable and included everything to make it feel like home. 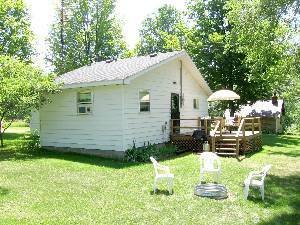 The cottage was conveniently located to both the city and the Lake. Thank you for the opportunity to enjoy my stay. What a wonderful place to stay! We so enjoyed the clean and cozy cottage for our vacation. It was so relaxing to finally decompress with the quiet area around the cottage. The added plus was being able to bring our pets and having so much outside room for them to enjoy. We will certainly stay there again. We greatly enjoyed our stay. 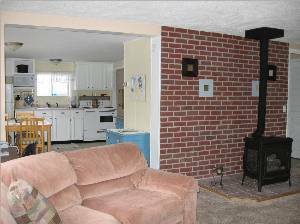 The home was very clean, with all the comforts of home in an up north setting. We have stayed in many up north sites, but this, by far, is the nicest place. We appreciated the opportunity to bring our dogs and it is evident that the caretakers (and renters) take very good care of the home and grounds. We will definitely make arrangements to stay again. I would like to say what a wonderful stay I had at George's Retreat. The cabin was so nice and the setting was very relaxing. Pleanty of room for the dogs to run and play. Would definatly rent the cabin again. We very much enjoyed our peaceful stay. The properity that extends beyond the dead end was a real treat for our Boxer dog, Lennox, and us. We also appreciated having everything needed to have a "home away from home" experience. Deposit: A deposit equal to your first night stay is due when you make your reservation. We charge a fully refundable $50 deposit for travelers with pets.